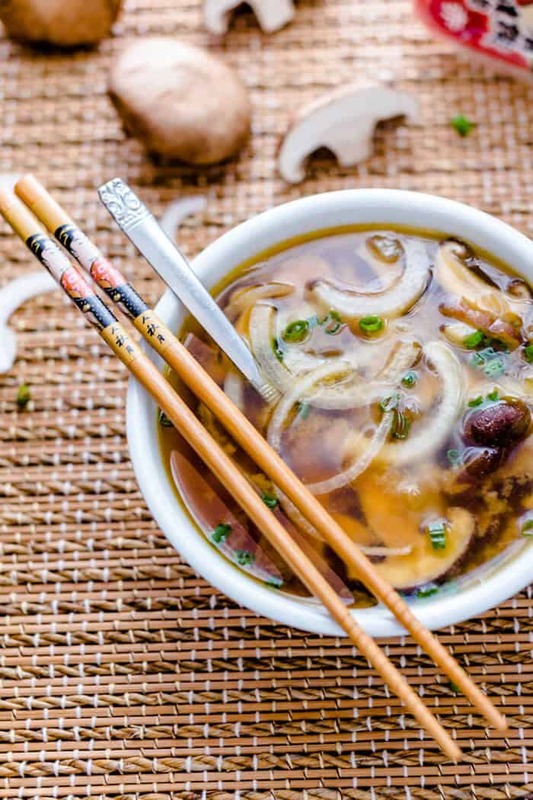 This Japanese onion soup with mushrooms is a delicious vegetarian & vegan meal starter. Best of all, it is low in calories and wholesome. Heat the oil in a large pot over medium heat. Add the onions and sauté with a pinch of salt and pepper until they begin to soften, about 5 minutes. Add the ginger and garlic. Sauté for another minute until fragrant. Add the broth to the pot and the mushrooms. Bring to a boil then reduce the heat to simmer for 27 minutes. Whisk in the miso until fully dissolves. Add the tamari and simmer for another 3 minutes. Season to taste with more salt and pepper if needed. 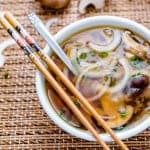 Serve in bowls with chopped scallions on top.